I love Mexican food but it’s not always the most fat loss friendly cuisine. Until now! 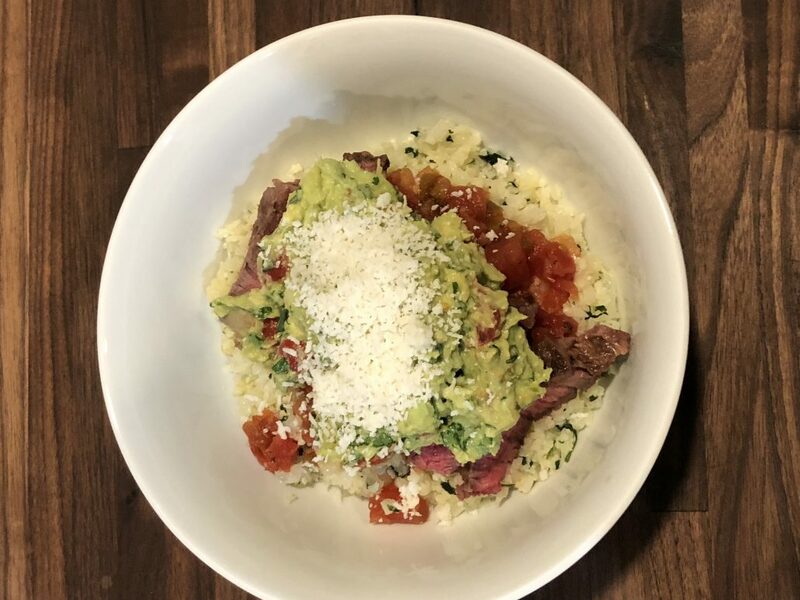 I hope you love this keto burrito bowl as much as I do! A quick note before we dive into the recipe: I used a grass fed ribeye from Butcher Box but you could use anything. You could skip the meat and add fajita style veggies. You could use chicken, pork, shrimp, fish or turkey. Use what you love! I’m gonna assume you know how to cook meat. If you don’t, Google it. Step 1: cook your meat. Let it rest. In your skillet, melt butter and add garlic & onions until onions are slightly translucent. Then add cauliflower, stirring occasionally. 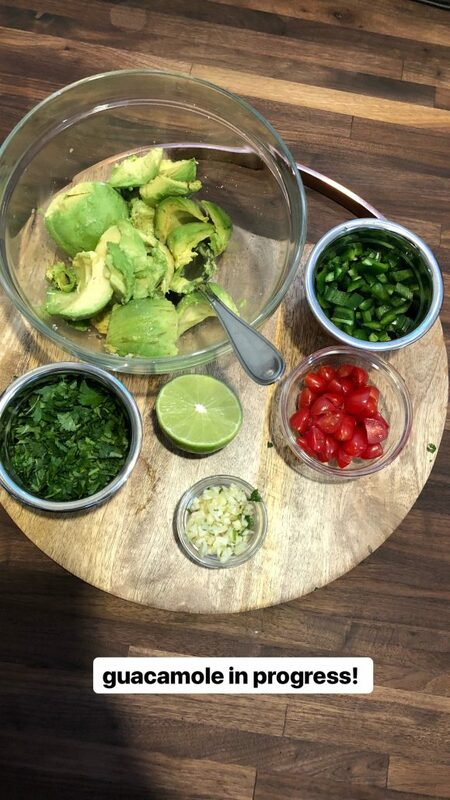 After about 7 minutes, add salt to taste, cilantro & lime. Cook for another 5 minutes before removing from heat. In a bowl, add all ingredients & mash with a fork. Build your bowl. 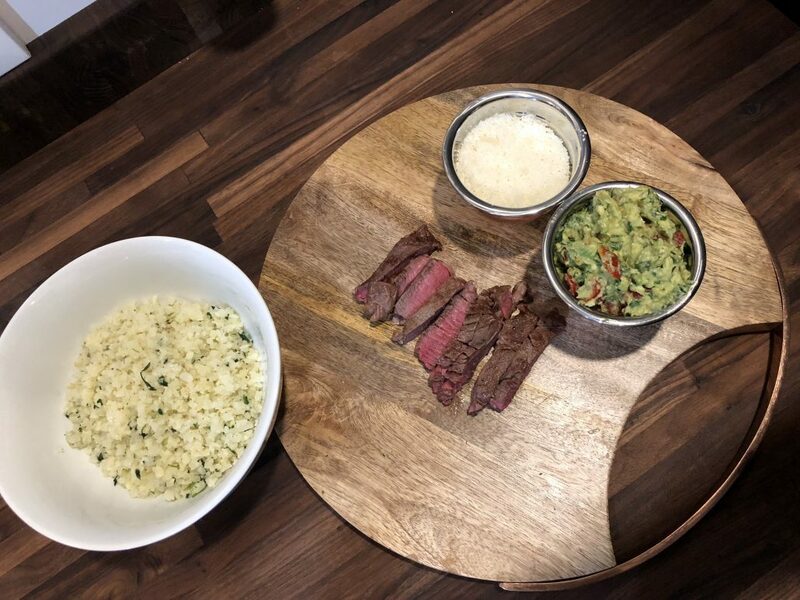 Cauliflower rice > salsa > guacamole > protein of choice > your other favorite toppings. If you want to see more of my meal ideas and what I eat, make sure you’re following me on Instagram! I share my daily eats and meal ideas in my Instagram stories (different than posts). If you want to learn more about fat loss nutrition and eating foods you love that love you back, you can download my free fat loss food guide here. Looking to learn more about ketogenic diets and eating fat to lose fat? Check out these podcasts! That sounds delicious! I’m fasting at the moment, but will definitely put this at the top of my list of post fast foods. Yumminess! Enjoy your fast! Let me know what you think of the burrito bowls when you give them a try! Ended my fast yesterday, and tried the burrito bowl for dinner this evening. Food has such a magical quality coming off of a fast, doesn’t? Anyway, as for the burrito bowl…LOVED IT…and most of my family did too! However, my husband (not the most adventurous, or open minded eater on the planet) did not, but only because he doesn’t like cauliflower. Do you have any suggestions for something other than cauliflower to substitute for rice? I’ll definitely fix it again.